On October 6th at Lindberg Park in Culver City, California I had a picnic/party to celebrate my friend Kecia’s birthday. I was a second year graduate student at UCLA and as a nice gesture, I invited the first year graduate students. A student named Gary came to the picnic, but not alone: he was accompanied by his friend Sir, who also brought James. So that means that James was a double party-crasher! James said later that he thought that I was really cute in my orange Stussy hat. I honestly don’t remember him being at the park; when we got the photos back from the developer Kecia and I said, “Who’s that guy?” Funny! But isn’t it great that I have photos of the day we met? After the picnic we kept running into each other on UCLA’s campus. One day James saw me sitting near The Bear reading and asked me if I wanted to get some cheesecake at Jimmy’s Coffeehouse. I was impressed that he (an undergraduate) knew about Jimmy’s (a graduate student hang-out). Besides, who am I to turn down free cheesecake? We kept in touch after that, but the first “real” date was months later on January 21, 1992. James took me to Hamlet Gardens, a nice restaurant in Westwood, for dinner. I thought that was pretty impressive, but I later found out that he had cleaned out his bank account for that meal! The next day we went to see a live taping of the show Roc and on Valentine’s Day we officially became a couple. A year later he proposed. Through the years we have had lots of fun together throwing parties, going on vacation or just hanging out. We have also gone through some rough times over the years: the L.A. Rodney King riots, stressful moves to New York, New Jersey and Atlanta, illness and deaths of family members, 2 big medical scares with our daughter, a major earthquake, and even tremors in our own marriage. It’s not easy being married and we have taken our hits. But I am happy to say that we have come out on the other side victorious. We have learned that our marriage is not just for us or our kids, but it is a living testimony of God’s unending grace and a reflection of his love. As a result, we take our marriage vows very seriously. I don’t know the “secret” to a happy and long marriage, but after 15 years we are wiser and much kinder to each other. I think kindness matters. Always there is laughter and music in our house and we truly enjoy being around each other; we are each other’s favorite person. We’re at a very busy time in our life working hard and raising our kids and we don’t always take the time to be alone like we should, but we don’t beat ourselves up about it; we have time. Like forever. That sounds good to me! P.S. You may also like to read From The Husband: 7 Tips To Staying Married. 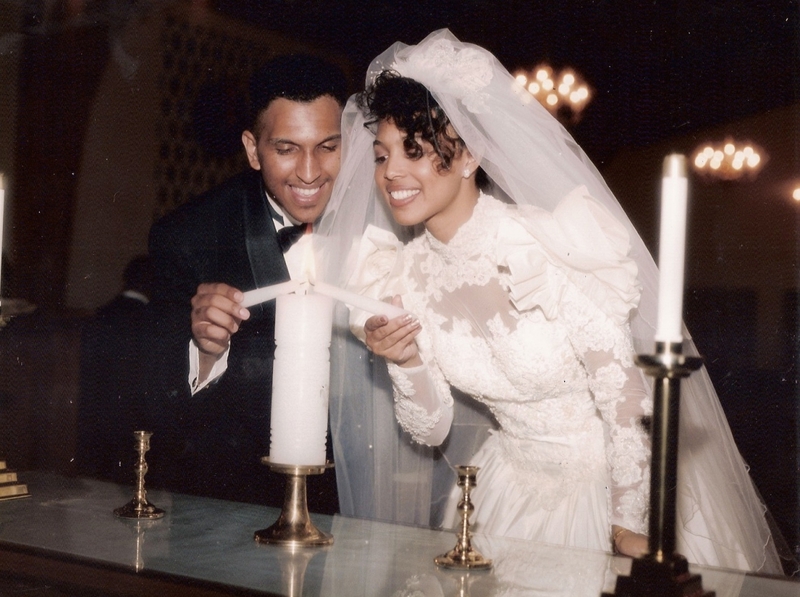 Happy Anniversary, Esther and Llyod! God Bless! WOW, 15 years that’s awesome! today is Lloyd and I 2 years anniversary and I am excited to see what God has for us. Many blessings to you and your family. esthers last blog post..Giving back!!!! you two are just too too cute! This is absolutely beautiful! What a wonderful story and beautiful pics! God is good! I loved it! Continued love and many blessing! What a beautiful story!! Thanks so much for sharing. Very inspirational. Love to you and James!!! This is really beautiful! I know James via Vivian Scott-Chew and he always speaks very highly of you. This was a great entry. I don’t have the pleasure of knowing you but I do know James from Ketchum, I’m in the NY office. I saw this since he and I are FB friends and I just want to say congrats on what sounds like 15 really special years together. You are a beautiful family and lucky to have each other! I loved the story and the pics! What a wonderful love story… and great pictures, too. Congratulations and best wishes for many more years! Smiles. as a second-year husband, this type of affirmation inspires me to stay the path of the promise I made to God and my wife. I already have a deep respect for James (for his PR acumen)and this new dimension of life and love is yet another inspiration. Thanks for sharing! I remember when you brought James around. I couldn’t imagine you both with anyone else, and it is a testiment to God and His love for us. WOW. Happy anniversary, cousin! WOW Sherelle you guys are beautiful! I must be in an emotional state, because I am in tears!!! God bless and keep the The Andrews family and protect your marriage for many years to come.